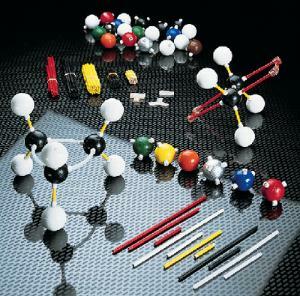 You can create molecular structures the whole class can see. This set is excellent for illustrating a variety of molecules (carbon, nitrogen, oxygen, sulfur, phosphorous, chlorine, hydrogen, bromine, iodine and metals) and various bond types (monovalent, H-bond, tetrahedral, octahedron and tri-bipyramid). Wooden bonds, tapered at both ends, and vinyl receptacles in the polystyrene atoms make connections a snap. Atoms are painted with durable, high-gloss enamel in nine colors that are coded to represent different elements. Wooden bonds are provided in ten lengths and five colors for easy bond identification. Flexible plastic rods can be used to make double and triple bonds. Models can be assembled to three or eight inches. The set includes double-lock connectors that prevent rotation of double bonds and flexible vinyl sleeves used to join orbital connecting rods. Once completed, this kit has 50 atoms and 112 bonds. Ordering information: This set includes instructions.